Perth's premier park is located in the heart of the city and spans across 1000 acres of beautiful parklands, botanical gardens and bushlands. 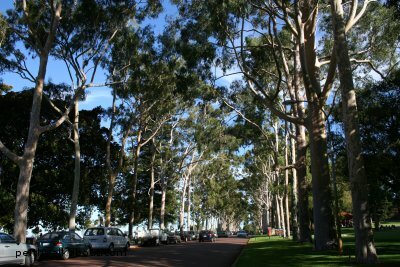 The main entrance to Kings Park is Fraser Avenue which is a spectacular tree lined boulevard. It is a great place to escape from the hustle and bustle of the city for some relaxation. Kings Park boasts an amazing range of flora and fauna. Take a stroll through the park on one of the nature trails or follow some of the interpretive trails describing the history of the area, botany and wildlife. Or alternatively, free guided walks by volunteers are available daily at 10am and 2pm each day covering various areas of interest about the park. Guided walks start near the Aspects Gift Shop on Fraser Avenue. Kings Park is also an excellent vantage point to capture photos of the Perth city skyline, the Swan River, and South Perth. If you are coming up Malcolm Road from the city, as you reach the top of the hill, take a left turn at the roundabout (landmark to watch out for is the Edith Cowan Clock Memorial) onto Fraser Avenue which is the main entrance to Kings Park. Alternatively, if you are in the city and would like a more strenuous and scenic walk, start your walk at the intersection of Mount Street and Spring Street. 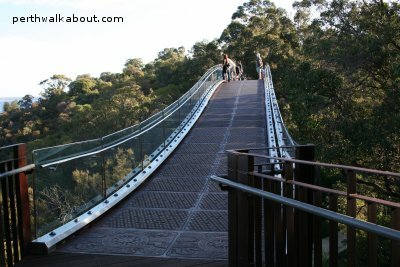 Then walk over the pedestrian footbridge and take a steep walk up Mount Street and you will reach Fraser Avenue, the main entrance to Kings Park. Note that Mount Street is a turn off from St George's Terrace towards the western end of the Terrace. If you are coming along Kings Park Road (heading from Subiaco), take a right turn at the roundabout onto Fraser Avenue. Perth Walkabout will be featuring favourite spots in Kings Park in coming weeks. First up is Jacobs Ladder at Kings Park. Find out whether Jacob's Ladder is part of Kings Park. Go to Jacobs Ladder. Fancy being high up in the tree tops? Go to LotteryWest Federation Walkway. Enjoy this 2.5 km loop walk with fantastic views of the Swan River, opportunities for wildlife spotting, and viewing flora in Kings Park. Go to Law Walk. View these wondrous ancient trees near the Law Walk. Go to Boab and Grass trees.